Bold, funky and fun, this cut combines chunky bangs in different lengths all over, which is easy to style and fun to wear. With plenty of product, this hip cut, full of bangs, is long on style and cool no matter what time of day! We also love how well this style morphs into a new style as it grows out. This can can easily be worn by women of all ages and styles, since you can easily pull this style off with many different twists! Look good and casual with this symmetrical bob chopped above the neckline. At the back of this bob hairstyle, you will see a fabulous well-tapered cut, contouring the head which will provide you a chic pixie look. Some Hollywood stars have picked this great look. You see the bang is a bit undefined and swept to one side, helping you to achieve a more relaxed look. This sleek bob looks good on finer hair. 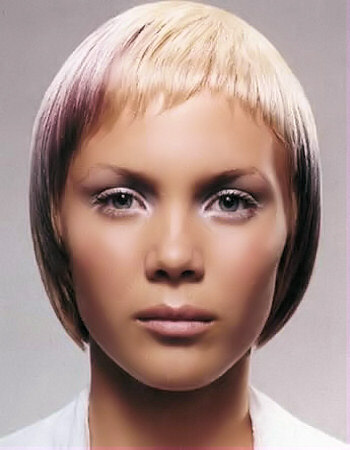 This fashionable hairdo has a bang bluntly edged and chopped at an angle then swept to one side. The razor-sharp angled cut is very stylish, helps you to achieve a sophisticated appeal. To make the bob look silky , smooth and sweet, it would be best to wax it to a great shape. While the title might sound just a little bit corny, this cut is far from even just a little corny, in fact, its nothing but HOT, HOT, HOT! Pulling from the crown of the head and angling down past the brow and eye line, this style highlights the mouth and chin and works perfectly with both diamond and oblong face shapes. Avoid this cut if you have a square face, since it will tend to highlight and bring the focus onto a square chin, instead of focusing on the eyes. If you have been searching and searching for a gentle and soft style that creates a sense of romance and intrigue, yet is special and unique at the same time, try this beauty of a hair style, With soft edges all around that softly frame the face, this style is easy to keep up and a snap to fix in the morning rush. By stepping out of the average, this cut will transform ordinary hair into spectacular hair in no time. Of all the pictures in this short hair style gallery, this is arguably one of the most striking of them. Those who don this particular short hair style will be turning heads wherever they go. This is a layered hair style, and thus it gives the perception of much â€˜fullerâ€™ than normal hair. In my opinion this lends itself well to almost all face shapes, although it does particular favor those with a slightly smaller face. This is the perfect hairstyle for going out of an evening, but it isnâ€™t so extravagant that it wonâ€™t work in a working environment either. Bobs are strictly just one single length so in this section the standard bob is all the hair cut to about half way down the ear and the front section styled to one side. However this doesn't give us much scope for inventiveness so we have included variations like layers and slight bangs. Take the bob cut to a new level with these razor edged layers from all around the ears and above the eyes, covering the forehead with a dramatic fringe of bangs. We recommend adding a smoothing gel to damp hair to create this sleek and daring look, allowing you to keep it in place from morning to night time. We give this sultry look five stars for sure! 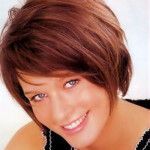 The hair that you see in this short hair style picture really gives the perception of â€˜fullnessâ€™. This is down to the amount of layers within the hair style. Of course, crafting something as elegant as the hair style that you see in this photo will take a lot of time and effort. However, if you ask your stylist exactly how to pull it off, then I am sure that they will be able to help you out! This type of hair style is perfect for any occasion, although with the amount of time it takes to get those layers just right it would tend to suit a special occasion more than anything. Bobs are strictly just one single length so in this section the standard bob is all the hair cut to about half way down the ear and the front section styled to one side. However this doesn't give us much scope for inventiveness so we have included variations like layers and slight bangs.